What has been the real political impact of Brexit? The fallout from Brexit has caused shockwaves across the UK political parties with as many as four having leadership elections. Beneath this however, what has been the impact in terms of party support? One of the most immediate impacts has been a surge in membership of the three oldest parties. Labour’s increase has been the most dramatic. Even before the 48 hours window that was created to allow people to register to vote in the leadership election, the party had been enjoying an increase in membership as Momentum got to work to sign people up to protect Corbyn from a possible challenge and the new Save Labour organisation did likewise to get Corbyn out. During the 48 hour registration period, 180,000 people registered as official supporters, more than the combined memberships of the Conservative and Liberal Democrat parties. This brings Labour Party membership to 540,000. The Conservatives have also seen an increase of about 10% on their 150,000 members since the referendum. Most joined to get a vote in their leadership election; anecdotal evidence is that many were revengeful remainers who wanted to stop Boris Johnson becoming Leader. Unfortunately for them, they hadn’t researched Conservative Party rules which require six months’ membership before being eligible to vote to prevent such manipulation. What is striking is that most are not, as might be imagined, former Tories who having left to join UKIP were returning to the fold now that they have their objective, but people who have not been a member of any party. For the Liberal Democrats the Brexit vote has been a lifeline. The membership of the party has increased by 10,000 (17%) probably encouraged by the stance taken by Tim Farron that the Party would remain pro-EU membership despite the verdict of the people. This surge in membership has been credited to young people. unhappy with the referendum result, joining a political party for the first time. More unusually, the Lib Dems have also claimed that a number of the new members are regretful leave voters who didn’t believe a Brexit vote would actually occur and were shocked by the immediate ramifications on business. 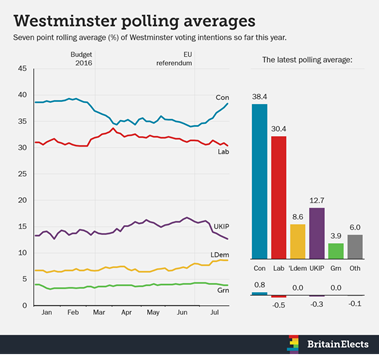 Although the opinion polls have fluctuated and been fairly meaningless since the referendum, now that there is a new Prime Minister and with Labour still in turmoil the latest poll giving the Conservatives 43% against 27% for Labour is not a surprise. The polling, if translated into seats at an election, would see Labour lose 46 seats and be its worst result since the SDP spilt vote in the 1983 election. Since the election last year, for the smaller parties there has been no change with UKIP on 13% (12.6% at the election) and the Lib Dems on 8% (7.9%) whilst the Greens and SNP remain stable at 4% (taken across the UK). An often neglected marker of party fortunes is the regular stream of council by-elections. Prior to the referendum most parties were holding steady including, surprisingly for a Government, the Conservatives. Since Brexit there has been more change with the main beneficiaries being the Lib Dems. They have totted up several victories taking seats from the Conservatives in Norfolk and Cornwall and also from Labour in London. It has recorded up to 33 percentage point increases in their share of the vote.